Alex Katz at age 87: Maturity and Its Muse Continues our Series Featuring the 21st Century’s Artist Muses. Alex Katz, Ada Ada, 1991. Oil on canvas, 59 7/8 x 120 1/2 in. / 152 x 306 cm.© Alex Katz/Licensed by VAGA, New York, NY; Courtesy, Timothy Taylor Gallery, London. 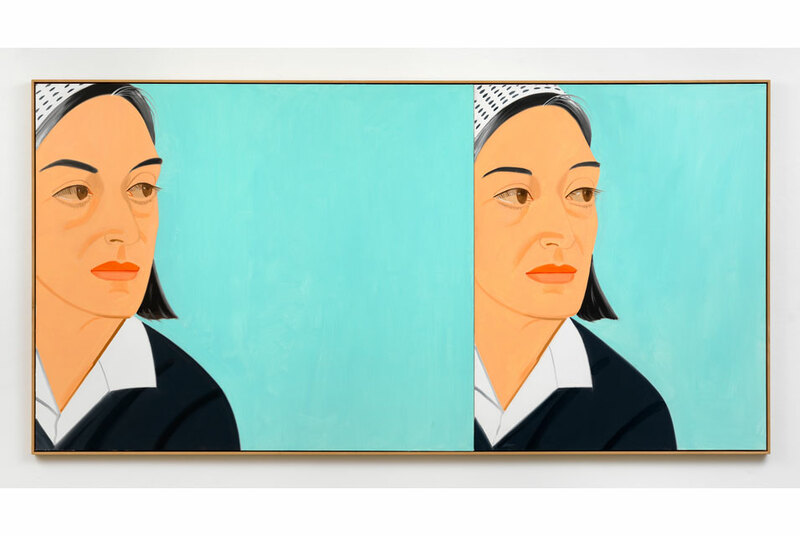 LONDON.- Timothy Taylor Gallery announces the sixth solo show at the gallery by the renowned American artist Alex Katz. The exhibition explores the progression and distillation of Katz’s distinct style through the 70s, 80s and 90s, and focuses on the thematic significance of ‘town and country’ during this period. Katz’s distinctive portraits and landscapes are noted for their flat surfaces, even light and finessed line. Determined to pioneer a style that set him apart from his contemporaries, Katz’s interest in scale, style and American life has remained constant throughout his influential and extensive career. Now in his 87th year, Katz is one of the most significant painters of his generation whose resolute style and surface brilliance has been an unquestionably important influence on younger artists including Peter Doig, Elizabeth Peyton and Merlin James. Alex Katz’s work is instantly recognisable: large scale, visually pure and often cropped. In Ada, Ada, 1991, a double portrait of Katz’s wife who remains a constant presence in his work, the vocabulary of film is evident – dramatic framing, cinematic cropping, and the repeated figure suggestive of the progression of a filmstrip. The flat, blank background of the deepest aquamarine is characteristic of the absolute immediacy of Katz’s formal technique. The aluminium cut-outs take immediacy to another extreme. Black Stockings, 1987, features six chic and flirtatious women, strutting in a catwalk of New York sophistication, their figures in stark outline against neutral wall space. Carter Ratcliff has stated that the difference between Katz’s paintings and the cut-outs, “comes down to a question of amplitude… they are Katz’s quick anecdotes”. Katz’s subjects – from his friends and family, and the stylish New York intelligentsia that is his social circle, to vacant buildings and parks shrouded in the darkness of night – become icons, celebrated and refined to a singular clarity. His economy of line and nuanced use of colour speaks of a confidence and lucidity of vision that has evolved since the 50s. “I want to paint what I see, I don’t want to paint what someone else painted. I live in New York and I go up to Maine, and that’s what I paint”. Alex Katz Although a born and bred New Yorker, since the 1950s Katz has spent his summers in Lincolnville, Maine. Over the years he has captured his summer home and its surroundings in all their rural splendour. Katz himself notes that the joy of nature is that it, “is always changing, always in motion. The light changes, and your eyes change. That produces a state that is close to automatic painting. You can’t think fast enough to keep up with it. You get ahead of your conscious mind a little bit.” As is evident in Three Cows, 1981, the natural landscape of Maine offers Katz an arena of abstract exploration; here nature becomes the sole stimulus and allows him space to open his eyes and mind to paint automatically. Alex Katz has been the subject of over 200 solo exhibitions, most recently Give Me Tomorrow at Tate St Ives, and Turner Contemporary (2012); Alex Katz: Naked Beauty, Kestnergesellschaft Hannover (2011) – the first exhibition to focus on Katz’s nudes; The Albertina, Vienna (2010); The National Portrait Gallery, London (2010) and Whitney Museum of American Art, New York (1986). He has been exhibited in nearly 500 group shows internationally since 1951. Throughout his career, Katz has been the recipient of numerous awards and his work is held in over 100 public collections worldwide. In 2008, Anthony d’Offay donated a group of works by Katz to the National Galleries of Scotland and Tate, which has since toured the UK as part of the ARTIST ROOMS project. The latest display of these works can be seen at Tate Modern from May – September 2014. A major solo exhibition will also open in May at the Albertina in Vienna.